Just go out into the internal garden to immerse yourself in an atmosphere of dream and quiet: ancient olive trees and citrus trees hidden by the clamor of the city and with a suggestive view on the monuments and palaces of Rome. From breakfast, to lunch, to candlelight dinner, our Unique Al Palatino Garden Restaurant will be your oasis of peace to taste the best delicacies offered by our restaurant. At the entrance to the Unique Al Palatino Garden Restaurant you will be preceded by a dreamlike atmosphere suspended in time, framed by centuries-old olive trees and citrus trees, far from the noise of the city and with a striking view of the monumental remains of the ancient city of Caesar, the medieval towers and the aristocratic palaces of the papal Rome; even more fascinating when the sun's rays are illuminated by the burning Roman sunsets. 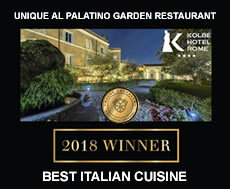 Collected among the enchanting vaults, the interiors of the Unique Al Palatino Garden Restaurant Rome offer a perfect combination of past and present, a welcoming and at the same time sugsestive atmosphere: the ideal background to start dreaming the dishes of the chef. 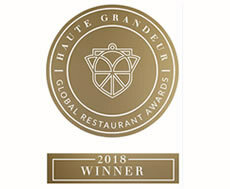 In addition to an environment of refined elegance and ancient and reserved charm, at the Unique Al Palatino Garden Restaurant you can taste our exceptional culinary creations. All dishes are cooked with passion and skill to give our guests a unique and unforgettable gastronomic experience.